Summary: As a transport ship is sinking, Nanoha and Fate manage to survive by escaping onto a dilapidated life pod. They must do everything they can to endure, lost in the stars, as the pod begins to systematically break down. Disclaimer: I own what is my own. Magical Lyrical Girl Nanoha is not one of those things. Inspired by Yann Martel's Life of Pi. It was during the second quarter of the year when this story abruptly showed itself to me. This book was born because of my lack of inspiration. Let me explain. I had already published my first novels earlier, all from the same series, all sold on Mid-Childa. Sadly, the public seemed to mostly ignore them, or else lambasted me with vague accolades (a fate far worse than ridicule; that at least would have garnered me some attention). I did my best to help the books along. But despite telling everyone I met about them and regardless of the many public appearances I made, the books simply would not sell. They lined the shelves of book stores, collecting dust in the same way governments collect outrage. They died undignified deaths. I must admit that the experience affected me badly. What had I done wrong? My theme was good, my words simple yet grand. Sentences flowed like honeyed milk from the promised land. And ah, the characters, why, they were so full of life that anyone could have sworn to have met them around the corner just the other day! The atmosphere was full of tension; the dialogue witty and charming. Any and every part of a story that needed to be good was great. And yet, for all the colourful descriptions and even the beautiful dramatic plot, the story was missing that all important spark, which would have made it into a real story. That feeling of throwing countless hours of brainstorming and researching away; I tell you, it really kills the soul. As any writer will tell you, a fresh and healthy soul is needed in order to truly tell a good tale. So I deleted all my notes on my series. The last book had ended in a reasonable manner, and I felt that it was better than anything I could have done to it now. I then sat down in the most comfortable chair I owned and opened a new data file, sure that words would come pouring out onto the page. It was not to be, of course. But it was this very lack of inspiration that lead me to the online page of a travel agency. They were offering a very good deal for a ticket to a world called Anumbria. I checked what people had to say about the place. "Quaint." One reviewer called it. "Peaceful," said another. Well, I thought, perhaps it was the busy ambience of Mid-Childa that was stifling my muse. And why, didn't I have that small traveling fund in the bank? The more I reflected on the idea, the more appealing it seemed to me. So I called up the company and arranged an economy class flight to Anumbria. The inter-planetary flight was not as bad I as feared it might have been. There were no crying children aboard, the flight attendants were diligent in their work and the man sitting next to myself neither had an avoidance towards bathing, nor a partiality for cologne. This was a good omen, I thought to myself. Because of my relaxed state of mind, I was able to strike a conversation with the man next to me. Without ever learning his name (nor he mine) I garnered that he was a native of Anumbria, he had two daughters, was divorced, and that there existed a café in the city I was heading towards that was so astonishingly breathtaking that, he assured me, I absolutely had to visit or else go through life in without a taste of the divine. Interested, I asked for directions and he gave them to me willingly. I arrived in Anumbria City, whether the planet was named after the city or whether the city was named after the planet, I still don't know. It was populated by a mere two hundred million people, making it utterly inconsequential compared to Mid-Childa. A full three months away from the capital, it had no particular significance to galactic history either; the wars it had been involved in were confined to the surface and did not affect much at all. In any case, it had been at peace for nearly five hundred years now. Boring, some might say, but I had the notion that this was the perfect place to conceive of a story; in much the same way college students lock themselves away from the rest of the world in order to complete their assignments. This grand strategy did not work nearly so well for me as I thought it might, so I left my hotel room and wandered to the café that I had heard so much praise about. It was called the River Café, and it was located, appropriately, near the Nenu River. There was no air conditioning, but three large fans kept the place from being stifling. And the cool wind provided was needed, because the place was filled to the brim with eager guests, which I felt spoke well of the quality of food there. I stood there for a while, looking for an empty table, before realizing that you were expected to sit where you want, with whoever is already there. I found that they serve good coffee, and a type of bread that makes my mouth water just thinking about it. The person I was sitting with was an old man, but still spry enough to make conversation easy. We made the usual small talk. I told him I came from Mid-Childa, and confirmed that there were many mages there, and that magic was real. When I told him I was a writer by trade, and was here on business, he held up a hand to get my attention. He said, "I have a story for you. It will make you believe in love." This is the bane of writers everywhere; the need to hear all stories, yet knowing that most are not any good. Furthermore, love stories are a dime a dozen, and are a definite deathtrap if you want to gain notoriety (the goal of all authors). So I had to make sure that this story would be unique (unlikely). "Does this story have to do with two tragic lovers who overcome their hardships to be together?" "Yes." This was not encouraging, as you might suspect. "Does it take place in the distant past or the far future? Or in a castle somewhere in a strange land?" The elderly man smiled. "No, no. It takes place not five years ago on a life pod, and starts not long before that." I confess, I was intrigued. "Tell me your story then." What was this? Had I been hoodwinked by a con artist? Was this some sort of Anumbrian prank that I was unaware of? "I can tell you the story, but it's better if you heard from the source of it all." So I took out a pen, and he wrote the address of the woman who was one of the supposed main characters. "There are two," he said, "and I know them very well. They are good girls, and won't mind a few questions." He gave me a few vague details about the story and sent me on my way. I returned to Mid-Childa, but instead of taking a cab home, I directed the driver to the location of this main character. I rang the doorbell. Mrs. Takamachi answered. I asked her about the story. She laughed, telling me that it happened a very long time ago. "Not so long that you can't see the beginning and the end." I pled with her, desperate. Mrs. Takamachi thought about it. "Alright." She agreed. "But you have to listen very carefully." I showed her my voice recorder. She nodded approvingly and I was invited in. I have tried to be as accurate as a can in writing down her account and if there are any mistakes, they are solely mine. My name has no meaning, at least as far as my family was concerned. This was because my father was determined that I should go through life freely. This was something of an obsession of his, which was fortunate for me. At the age of nine I had already become a mage, and not long after I officially became a member of the Time-Space Administration Bureau. So it came to be that I was named Nanoha, which used no kanji at all, and thus, held no inherent meaning. My father, Shirou Takamachi, had been injured in a work accident and therefore was not present at my birth. When I was younger, this used to bother me sometimes, but Father was quick to assure me that he loved me just as much as my two older siblings, Kyouya and Miyuki. 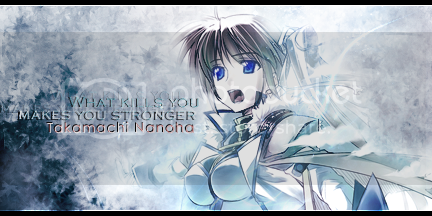 "Don't worry, Nanoha." He told me once. "I'll always be there for you." But Father was preoccupied with Mother, being still very much in love with her, and would unintentionally ignore me for lengths of time. My siblings were no better, both being born a decade earlier than me. They knew each other's quirks and for all purposes were practically of one mind. Mother used to say, "They are two halves of a whole." As such, I felt very much like the unneeded wheel in this family. I was the spare tire at the back of the car, which was never really required but was somehow still there nonetheless. This is not to say that my family didn't love me. They did. I was simply too young to play with my siblings, and my parents were forever busy. For a while, I thought that I would be able to share in the comfort of having a second half when I met Suzuka Tsukimura, but that was quickly dashed when she found a best friend in Alisa. So it was that I grew up in a half filled state of not-quite-loneliness, which was neither good nor terrible, but which made me desperate for the kind of companionship that those around me possessed. My childhood was not as bleak as that made it sound. For you see, I was raised with a caring family in a warm home above a bakery. It was Mother's business and it was called the Midori-ya – which could be translated as 'Green House'. It wasn't green at all, but that was its name. Business was good, which meant that there were many regular customers who relied on it to supply them with baked goods. For them this was the Mecca of all bakeries to be supported at all costs. For me, it was a paradise. It may be that the weight of years that has compressed my memories of it into a diamond, but I recall nothing but fondness when looking back upon my upbringing there. I was never woken up by something so unseemly as a loud alarm clock. No, it was the combination of the gentle humming of my cell phone and the tantalizing smell of baking bread that would rouse me. Breakfast was always different and good. Mother would send me off with a packed lunch – but made with all the professionalism she could manage. It might be a pizza bun one day, chicken the next and sweet taro after that and so on. It wasn't all fun, of course. There were still things to be done in order to keep the café running. I helped with setting up and cleaning up. I learned how to fix mechanical things, due to the hopeless television, air conditioner and front door that we had. For a child, it seemed like very hard work. But I didn't mind. It helped me feel useful, which is the one thing which I truly wanted. And then my prayers were answered. I was nine when I discovered a talking ferret and a strange red jewel in my hometown. The year was 0065, according to Mid-Childan reckoning. This was the beginning of the Jewel Seed incident which occurred mostly on Earth. I won't go into much detail – much of it is classified, and the rest can easily be found. However, I will say that it was during this time that I met Fate Testarossa who, in the course of only half a year, became very important to me. I still recall the moment we exchanged our hair ties, and our friendship, with something approaching crystal-clear clarity. This did not go unnoticed by the rest of my friends. It happened the very day I returned to school, during our first break. Suzuka, who was kind but really didn't foresee the merciless teasing that Alisa would put me through, mentioned the black ties around my hair that had been given to me by Fate. "They're very nice. When did you get them?" I told her that I received them during the weekend, and then she asked my where I had found them. I didn't know how to bring up Fate without telling them about magic (they were entirely ignorant about anything that I had been up to the last half year) and so I replied vaguely. "A friend gave them to me." I hoped that might be the end of it and for a moment I thought it might be so as Suzuka nodded her head in acknowledgement, but it was not to be. I had forgotten about Alisa, who jumped on the opportunity. She was a wolf, and I a deer. "A friend? It is a boy?" she asked me slyly. I shook my head. "She's a girl." Alisa's grin made me nervous, but I couldn't understand why. "I wasn't aware that Nanoha was so close with someone; close enough to exchange a gift like that! What's her name?" No one can deny that there are some things within a child's limited experience that they are undeniably naïve about. Growing up in a bakery, I had been far too busy to watch such things as dramas on the television, or watch anything at all, really. The only love I knew about was the love that my parent professed to have for me. So it was the combination of innocence and trust (in Alisa, strangely) that would spell my doom. Because I didn't want to spill everything I knew about magic, I waffled. I gave a little hum, I hesitated a little, and then I half closed my eyes in order to think of a good enough misdirection. This was too long for Alisa, who looked as though she wanted to shake me wildly for the answer. Suzuka noticed this, and interrupted. "This girl," she paused, "is she… special to you?" It is clear now that she wanted to give me enough rope to escape Alisa's line of questioning. I should have taken it. I should have said that no, she wasn't special at all, that it was a family friend, or something of that nature. That rope was my lifeline, and Suzuka was trying to help save me on the other end. Instead, I hung myself with it. "Yes!" I half-exclaimed and half-sighed. "She is!" Suzuka choked and Alisa beamed with the glow of a general who had utterly outmanoeuvred the enemy. All that was left was forcing a surrender. "If she's so special, then why won't you tell us about her? Doesn't Nanoha think of us as friends?" Alisa, by some evil means, had managed to appear incredibly wounded by my apparent lack of faith for her. I was too panicked by the insinuation of distrust. And even if I weren't, I wouldn't have caught the trap anyway. "Fate!" I came clean, spilling the beans. "Her name is Fate." My voice was filled with longing and hope. I longed for (as I said before) a second half and I hoped that it would be Fate. We understood each other, I had thought then, and that was more than anything I had at the time. My friends, bless and curse them, heard the desire in my voice and utterly misread the situation. "Oh." Suzuka sighed, looking at me starry-eyed. Alisa too, gazed upon me admiringly, muttering "so it's like that, huh." They looked at each other, and seemed to come to some sort of conclusion. "Nanoha," Suzuka said in her most serious tone of voice, "you have to tell your parents." Alisa nodded, agreeing with her. I was confused. Bamboozled even. "Tell them what?" Suzuka frowned. "It'll be okay. Just tell them you find girls more attractive than boys. And that no matter what, you'll still be their daughter." "And if they kick you out, you can definitely stay at my place. No matter what!" Alisa said fiercely, apparently awfully worked up about something. Never before had I seen my friends so united and deadly solemn. Sure that they knew what they were asking of me, I agreed to do what they told me to. It should be noted that any nine year old girl will undoubtedly choose to be with others of her own gender than a boy. It was my luck to have parents like mine. Still, as with any other child, I knew that there was a better chance of approaching them when they were in the best of moods. For my father, this was always around half an hour after dinner, when he was full and very receptive to ideas. It was the same for my Mother. So as they finished washing up in the kitchen, I moved resolutely in the doorway. I gave them a stern glance (this was nerve-wracking, but Alisa insisted that this was how to do it) and told them that I needed to talk to them. My parents looked puzzled to have their way blocked by their youngest daughter who only was half as high as them. I should tell you that my parents held moderate viewpoints on most things in life, with a slight liberal leaning. Father, as I have already explained, saw himself as the type of person who would allow his children as much liberties as possible, while Mother only cared about our own happiness. "It doesn't matter what you choose to do with your life," she used to say, "as long as you are happy doing it." So after giving each other glances that said do you know what this is about and receiving in return not a clue darling, Father took the initiative and asked me what it was that I wanted to tell them. Consequently, I repeated Suzuka's words verbatim. "Father, Mother, I like girls." "We know," Father said, "Your friends are here all the time." Mother's eyes widened briefly, before dismissing what I said as youthful wrong usage of words. This was exactly what Alisa had predicted would transpire, so I continued on with the script. "No, you don't understand. I like girls. Not boys." My parents looked surprised. "You must be mistaken," Father assumed. I repeated my words. According to my friends, I had to keep doing it until they fully accepted what I was saying. At the time, I thought that this was to prevent the unwanted intrusion of boys into our house, but my parents were thinking along the same lines as my friends. "Okay. Alright. Fine? You like girls." Father looked completely out of his depth. I nodded earnestly as possible. "I hope you still consider me your daughter." I tried my best to look nervous. Essential, Alisa once again had assured me. Suzuka had looked doubtful, but had nodded anyway. Flustered, Father hesitated. Mother smacked him on the arm and knelt down to look at me straight in the eyes. "Of course we do." Her warm arms enveloped me in a hug and I returned the favour. Father, knocked back to reality with this display of emotions repeated Mother's words and also embraced me. Father then called my siblings and explained to them what my preferences were. They also gave me their support. So it was that Alisa's and Suzuka's machinations netted me a moment of pure bliss, but would cause headaches for me for a very long time afterwards. Soon after, around the time Fate was determined to be put on trial, the Book of Darkness incident happened. Once again, I can't go into much detail, but suffice to say, it ended with Fate and me enrolling into the TSAB. It wasn't a terrible ordeal. We were incredibly talented, or so my former instructors tell me, and we had an abundance of magical power. Still, the 0070's were a troubled time. The TSAB were low on manpower and the news was ominous. There were whispers of rebellion. If the Bureau couldn't keep order, what was it worth staying with Mid-Childa? People wondered. I was too busy with my studies to notice, but Fate worried. The effect of all this was that the TSAB accelerated their training programs. They were determined to push out mages as fast as possible. As a direct result, both Fate and I decided to take our S-rank examinations far ahead of a normal schedule. We signed up feeling confident in our abilities. They informed us what the test would be consisted of. We would be dropped onto Guran, a world devastated during the Saint King Unification War, and would need to survive against the hostile beasts there for a month. They confiscated our intelligent devices on the spot, claiming that they needed to determine our skills without us using any crutches. We prepared, going through all the magical techniques we knew of. I wrote home, assuring my family that we would be fine and not to worry about me. I knew that if I passed this test, I would have financial security for the next ten years, at least. And I would have a great deal more freedom within the military if I were an S-rank mage. But there was also paperwork. The amount of it was immense. There was the application for the test itself, which was quick. But then there came letters of recommendation, applications for interviews, application to use those interviews etc. Dotted lines existed everywhere. But we managed. And when we finished, I felt as though that could have been the test itself, and rightfully so. The result of all this was that we received the name of the cargo ship we were to board. The Unto Dawn it was called. We boarded. Her officers were friendly, if aloof, and the crew generally ignored us and we never found out much about them. The ship was large, but not particularly impressive. It passed all the safety requirements though, a piece of paper near the boarding area stated proudly. We were shown to our room, which Fate and I shared due to the lack of space onboard the ship. The launch alarm sounded, and I felt a brief moment of acceleration until the dampeners took care of that. I bid a silent farewell to Raging Heart and Mid-Childa. When I come home, I'll be an S-rank mage – that's a promise! Naturally, things really didn't work out like I planned, but since when do they ever? You take what you get, whether they're friends or enemies, and you make the best of what you have. She's married. I see the ring on her finger and I ask her about it. She waves her hand, smiling. "That's part of the story. You'll understand soon enough." She gestured at me to follow her, so I did. She moves through the kitchen before sitting at the dining table. I notice her cupboards; they are filled to the brim. There is enough food here to supply a small army. I notice something else. A small girl, blond, peeks into the room. "Hello," I say. She runs into the room and hides behind Mrs. Takamachi. She looks at me bashfully. "This is my daughter, Vivio." Mrs. Takamachi's voice is proud. We are interrupted. "Nanoha-mama, where’s Fate-mama?" Mrs. Takamachi surreptitiously winks at me and acts sorrowful. "Am I not good enough for you?" Horrified, Vivio shouts loudly, denying it. Mrs. Takamachi laughs and picks up her daughter. She softly presses the tip of Vivio's nose with her index finger, to which Vivio giggles. And as Mrs. Takamachi and her daughter delight in each other's company, I realize something. This story is a good one. Note by me, the author: This isn't a bad way to introduce myself to the forum, I suppose. An introduction gift-wrapped with a new NanoFate story, here for your perusal. So this has been in the works for a while now. I've planned out pretty solidly the first half of the plot, so updates should be pretty consistent. The first chapter is only to set up the rest of the story, consequently, from the next chapter on it'll be (not so) smooth sailing. Please, if you find any errors at all, do not hesitate to tell me. Improving my writing means improving your own reading experience. Also: Hello. Great place you have here. Please forgive any unintentional gaffs that may occur as a result of being a new member. Thanks for the kind words! Sadly, I have no beta... I was kind of hoping that I could rely on this forum to catch my mistakes (hint). Second chapter should be out in a couple of days, but who knows what'll happen? Nice! I can't wait to read more! I already favorited and Story Alerted it so I hope you won't disappoint! Update soon! "And as Mrs. Takamachi and her daughter delight in each other's company, I realize something. This story is a good one." I'm loving this fic, your writing is very professional. I'm not sure where this story is heading but what you have written so far is great. I loved the bits from the author's point of view, specially at the end talking to Nanoha and getting the feeling that this was going to be a good love story, because as a reader I felt the same way. I think that Nanoha coming out to her parents at the age of 9 was a first in fanfiction xD That was funny, young Nanoha is so naive, I wonder if this will play a role in the fic in the future? Well, this fic is really promising. I'll be looking forward to the next chapter. And welcome to our site! I hope you have fun here. Thank you, everyone, for your kind words. As always, if you find any mistakes, let me know. Next update might take a while - it depends how much I get done before Sunday. I'm eager to see the next chapter. I'm gladly impressed by the quality of this writing, we're only in the second chapter but so far this looks as one of the best Nanoha fanfics I've read recently. I liked this chapter a lot. The end was specially intense, when I read the last line I could feel Nanoha's regret and desperation. I hope you can update soon, I can't wait for the next chapter. I wonder how they'll react to the lack of water and to what may happen in the next chapter. Also, a quick question: how old are them? In the first chapter I think it was said that the story was 5 years ago, but the second chapter makes me to think that this is earlier in the series. I won't answer that directly - save to say that the author met the old man in the cafe and Mrs. Takamachi around one year after Mobile Section 6 was dissolved. I'm being deliberately vague here, in case canon ever contradicts when (if) they took their S-rank exams. Addressing PMs: It might start upbeat, but I'm going to grind down Nanoha in ways that'll make you cringe. And then build her up again. I'm quite enjoyed reading this one so far, writing is really excellent. I can't wait for next chapter to see how our two girls will deal with this further. Only if you let me read it before you post it! This is so well written and the story is captivating ! I think we all want to know what happens next, pleaaaaase !! I'm so curious to see what they'll do without water, and I guess without food later ?